The S Health App Will Make You Achieve Your Fitness Goals In No Time! This free app not only helps you stay motivated and shed calories but also has personal training programmes. It tracks steps, cycling, running, and other sports and exercises. It also helps in managing food intake, sleep, caffeine intake, water and weight. It can help one set personal goals and awards you for achieving. At the end of every week, you will receive a weekly summary, which is like a report card of your performance. With its 5km and 10km training programs, you can transform yourself without spending hours at gym, dieting or insufficient training. 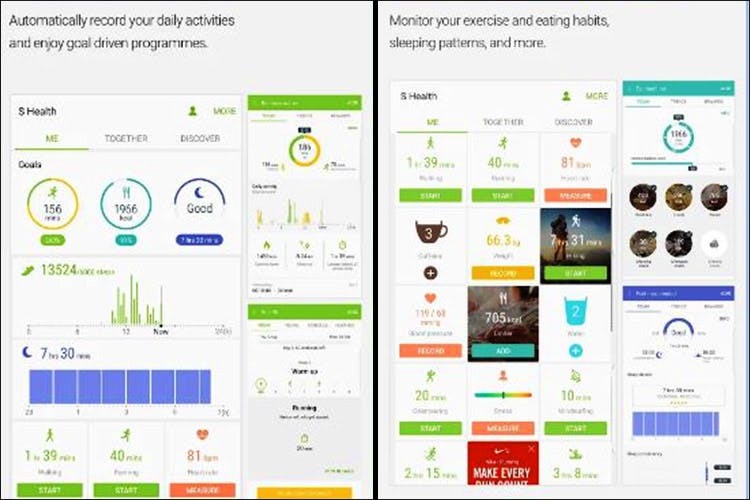 It also has a program where you can compete with your friends, and is compatible with most Android devices and other health apps and gadgets. I downloaded this app about a year ago. Since then, by just by using this app and reaching my goals, my weight reduced from about 125kgs then to 89kgs now. Also, using their 5km training programme, my speed has increased, and I can run a greater distance than what I could then. Their Baby Steps to 5k training program is quite good, and we’d definitely recommend it for those planning to run the upcoming marathons. Any health and fitness freak who wants to track their progress, as well as runners. Just keep yourself dedicated and motivated. The app will take care of the rest.